On Nov. 11, College Gameday visited The U for the Catholics vs. Convicts rivalry. It’s a Gameday tradition for students to make signs mocking the opposing team. College Gameday is also going to be at the ACC Championship on Dec. 2 when the Miami ‘Canes take on the Clemson Tigers. Distraction received many submissions and the team voted for its favorite. The winner is a cutout of Touchdown Jesus (a famous part of Notre Dame’s campus, located on the side of its library and overlooking Notre Dame stadium) throwing up the U. Congratulations! 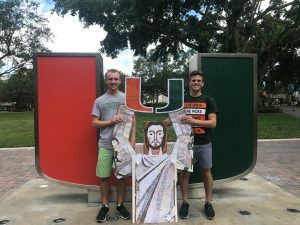 Andrew Garvey (left) and Michael Miano (right) show off their poster of Touchdown Jesus throwing up the U in front of the U. It moves! Alex Margetts (left) and Sean Hagert (right) demonstrate the features of their creation.